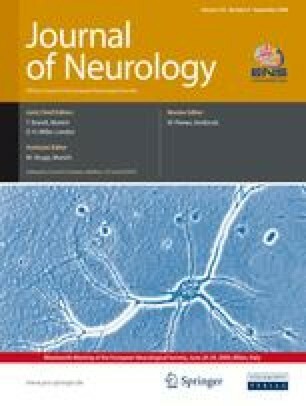 To assess the value of clinical and MRI variables in predicting short-term brain atrophy accumulation and clinical evolution in a large cohort of patients with RRMS, we studied a cohort of 548 patients, previously enrolled as a placebo arm of a 14-month, double-blind trial of oral glatiramer acetate (GA). A logistic regression model with EDSS progression as the dependent variable was built to assess baseline clinical and MRI variables associated with clinical worsening during follow-up. In 466 patients with complete central brain atrophy assessment, another linear regression model with percentage central brain volume change (PCBVC) as the dependent variable was built to assess baseline clinical and MRI variables associated with atrophy development. A total of 80 patients (15 %) had EDSS progression over the follow-up period. Factors independently predicting the probability to have a clinical progression were lower EDSS (OR = 0.78, 95 % CI = 0.62–0.97 p = 0.02) and higher T2 LL (OR = 1.022, 95 % CI = 1.006–1.038, p = 0.007) at baseline. In the 466 patients with atrophy assessment, PCBVC declined, on average, by –2.0 % (SD = 2.8) (p < 0.001) over the follow-up. The multivariate PCBVC analysis revealed that the PCBVC decrease was independently correlated with higher EDSS (p = 0.03) and T2 LL (p = 0.005) at baseline. The squared correlation coefficients of the composite scores made up of EDSS and T2 LL considered together were able to explain only 3 % of the variance in disability progression and only 4 % of the variance of PCBVC. In RRMS patients, clinical and conventional MRI findings at baseline only modestly predict shortterm accumulation of brain atrophy and disability. These data confirm the need to develop clinical and MRI measures more sensitive towards the more disabling aspects of the disease.